Sometimes Milt Dog likes to go incognito in the backyard. Odd, I know. 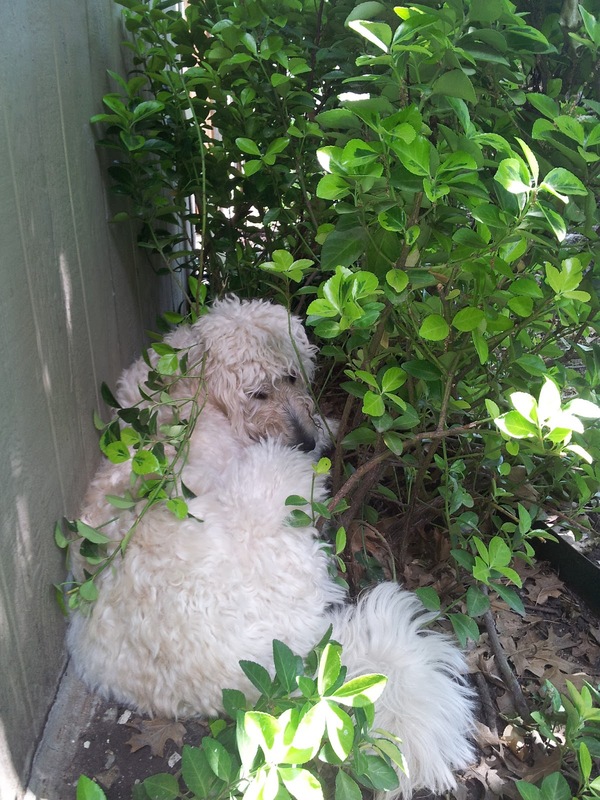 Sometimes I wish I could crawl behind a bush and hide too... It's just not as socially acceptable. Happy Monday, everyone! School's out for summer in three weeks. As much as I like my students, they are just as ready for summer as I am! Looks like The Milt is sad you're not home for the summer starting today! I do have plans, every June, the week of Father's Day, my husband plays golf for a week in Norht Carolina with the guys. "Bye Honey, have fun!" I holler as he drops me off at my BFF's house in Charlotte. We have been best friends since we became band geeks in 6th grade down in Ft. Lauderdale and I must say that my time with her in June is one of the highlights of my summer. What about you guys? Anything fun and exciting? Gonna hang in the sloughs near Momeaux's house? I LOVE how you write, Goob -- your life always sounds like so much fun! It sounds like you just make things a ball no matter what...! Yes, we do have a few plans. I will elaborate on DK.